The Western Red Cedar that iWood imports is grown over a vast area including the North West of the USA extending up into Canada and even Alaska. 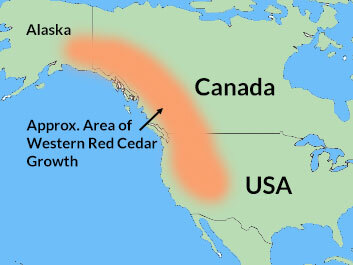 The map to the right shows the approximate growth area of the western red cedar tree. This area is known as the “Pacific Northwest”. Within this area, the western red cedar tree is one of the most common species found there and historically has many uses, including being fixed to buildings and houses as Western Red Cedar Cladding. Western Red Cedar can grow in a variety of climates as expected from range of areas it is found in. This is reflected in its extreme durability and is the main reason we recommend western red cedar for cladding.